Susan Orlean writes in her book Rin Tin Tin that at the outset of World War II, the movie-star dog reported with his owner Lee Duncan to Camp Haan, “where he was tattooed with his army serial number and rank (sergeant), and put through the same six-week training as the other dogs. In 1958, Anna M. Waller wrote a study called “Dogs and National Defense” for the Department of the Army. In her history she notes that of the more than 10,000 dogs trained during World War II, their tasks were broken down as follows: sentry (9,295), scout (571), sled and pack (263), messenger (151), mine detection (140). Today, there are about 650 dogs—helping to detect explosives—currently being used by the American military in Afghanistan and Iraq. 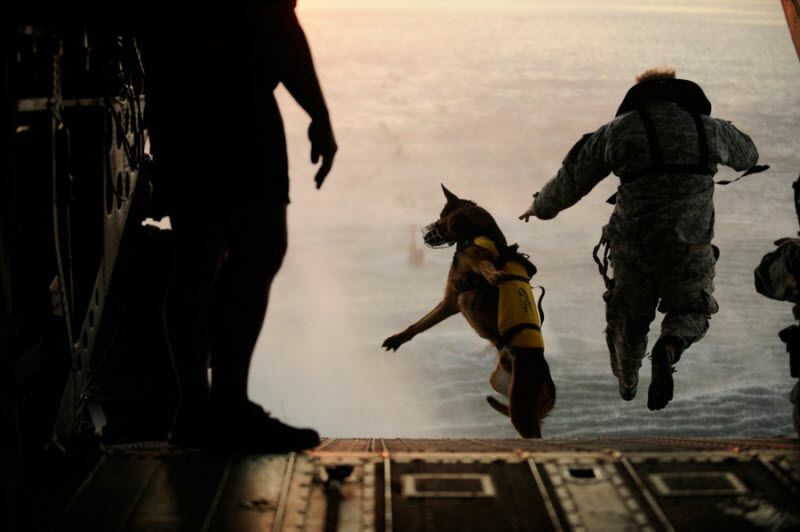 As the New York Times reported on December 1, when American soldiers leave Iraq, their bomb-sniffing dogs will remain behind. This is sad news for animal lovers, but we bring you a story of a bomb-sniffing dog with a happy ending: Sergeant Rex, by Mike Dowling and Damien Lewis, just published this month by Simon & Schuster. Read an excerpt on Amazon.